She joined the company in 2010 as a Trademark Agent focused on work with foreign clients of the company as well as International Communication. Vitaliya has a Master’s Degree in Economics, obtained at The National University of Life and Environmental Sciences of Ukraine in 2007 as well as specialization in Foreign-economic Management and Law in the same university and has practical experience in the managing of State financial control and audit of efficiency. Besides that, she changed her specialization to the benefit of IP, her skills in the field of financial analysis found use in the development of strategic profiles by the company management of IPR Group. Also Vitaliya is taking professional development training in Russian Academy of IP. 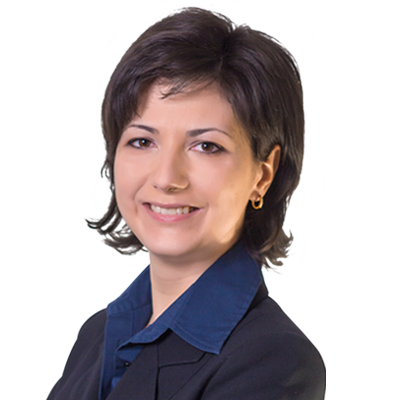 Throughout her career Vitaliya has acquired skills regarding all stages of trademark prosecution and litigation in CIS countries, namely caring out trademark searches with advising on possibilities of registration, drafting and filing trademark applications, trademark renewal applications, trademark assignment and licensing agreements. However, her main specialty is advising on the possibilities of overcoming provisional refusals, including preparing the objections and all related processes necessary for obtaining positive decisions, such as negotiating the letters of consent and co-existence agreements, support of processes for abandoning opposed trademarks in court and PTO. A large part of the projects she handles are within the pharmaceutical sphere and pharmaceutical trademarks, including registration of trademarks portfolio in CIS countries for further market entry. Vitaliya also manages court disputes, starting with legal advising on the chances and reasonability of court processes, and finishing with enforcement of court decisions. Vitaliya’s hobbies include Irish dances and horse riding, and she is a fan of classic ballet and opera.